This article does not describe how to apply weathering, but covers what weathering is and the many different processes that make an airplane look scruffy and used. Whatever method and materials you intend to use for weathering, the golden rule to remember is "Refer to Photo's". There isn't a standard application of "dirt" that will magically transform a model into a miniature copy of the full size airplane. Studying photographs will show you what dirt is particular to that airplane at the time the picture was taken and what dirt is common to that type of airplane. Weathering comes from, and is affected by, many factors, and we will look at them here in more detail. Take two identical colour swatches and place one in a cupboard and the other next to a window. A month later, bring them together again and the one sitting in the sun will be faded in comparison to the other. Ultra violet light is the culprit, bleaching out colours. Airplanes are no different, and high altitude flight, such as that preformed by the USAAF, accelerates the fading process. The fading is not uniform either. Top and side surfaces are more exposed than the undersides and different materials fade at differing rates. On many wartime airplanes, the flying controls were fabric covered to aid balancing and prevent flutter of the surfaces. These fabric surfaces faded extremely fast compared to the aluminium skin. Repairs to airplanes, where re-painted, were in fresh paint that stands out against the faded surrounding paintwork. 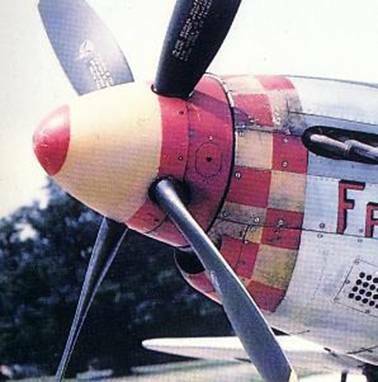 Squadron codes and kill / mission markings were applied after test and delivery flights to the theatre of operation and so would not be as faded as the overall paintwork. and the trim tab that can just be seen below the wing trailing edge. The metal panel around the exhaust stacks is steel and as a result, it discolours in a different way to aluminium. This airplane is actually painted silver rather than being natural metal, but on a natural metal airplane, the aluminium dulls down while the steel does stain. On olive drab painted airplanes, the paint fades differing amounts on steel and aluminium parts. It doesn't matter how careful the ground crews are, fuel and oil etc., gets spilled on and wiped off airplanes. It is likely that around any of the liquid fill up points, that there will be staining of the paint work, in addition to chipped and worn paint work around the filler caps. Oil leaks are also found around the bottom of the cowl. 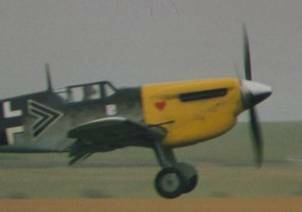 This slightly grainy picture of a Bf 109J shows streaks of blackened oil, from the oil cooler vent in the bottom of the cowl, extending back along the fuselage. Most often found around the cowl and engine compartment, fretting occurs where two pieces of metal are rubbing together, leaving a black oily deposit. Cowl fasteners are a favourite location due to engine vibration. Lubrication on hinge points, either control surfaces or access hatches, can also produce fretting marks. 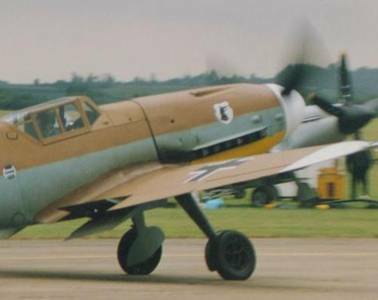 This Bf 109J shows signs of fretting along the yellow cowl panels. The dark fuzzy stains extend back from the lower cowl panel fasteners. The mess from the engine exhaust has to come out somewhere, either straight out of the exhaust stubs such as on the Spitfire, or via a turbo supercharger like on the B-17 or Lightning. Its location will dictate how much staining there will be. These three pictures show exhaust staining. To the left is a Hellcat showing a red/brown/black twin trail. The dirt has also engrained itself into the panel lines along the rear fuselage. 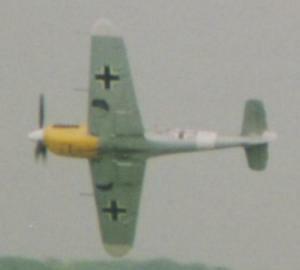 The Bf 109G exhaust trails clearly follow the airflow over the wing. Note how the cowl stands proud of the fuselage, resulting in a dense trail on the cowl and a fainter trail where the airflow has broken away from the fuselage. 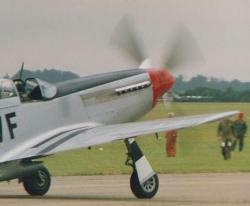 The exhaust trails on this P-51D show that the wings influence over the airflow extends right up to the cockpit. If the airplane is stored outside, it will be subject to wind, rain, hail and whatever else the local climate can throw at it. Why do your house windows need cleaning? because rain deposits sand and dust on them. An airplane stored outside will be subject to streaking down the paintwork from dust and dirt deposits unless washed regularly. Damage to the fuselage side of multi-engine airplanes is likely due to ice breaking from propeller blades when de-icing equipment is in use. Dented skin and chipped paintwork will be evident on the fuselage in the plane of the propeller disc. 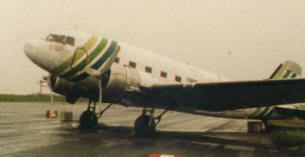 This DC-3 stood outside for over a year at Newcastle without any maintenance except periodic engine runs. Dirt has gathered in all the panel lines showing most clearly around the nose and engine cowlings. 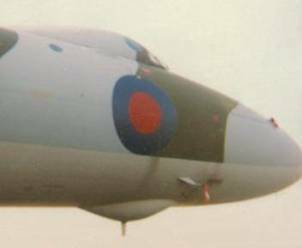 This Vulcan B2 arrived straight to Sunderland Airport from Squadron service. Despite its high speed and all weather capability, stains caused by rain persist as seen here streaking down from the roundel and ahead of the pitot tube. This B-17's engine cowling shows damage to the paint from the blast of dust, rain and hail by the propeller. Not shown in this picture, but paint can be chipped and the fuselage skin can be dented in line with the propeller disc, by ice that forms on the blades and then breaks free. The type of airfield operated from dictates airframe weathering also. Flying from a concrete runway will be a lot cleaner than from a reinforced muddy grass runway. Mud churned up by wheels will splatter the wing underside or fuselage in line with the plane of the wheels rotation. Dust and dirt can also be churned up by the propeller, which then blasts away areas of paint along the fuselage underside. 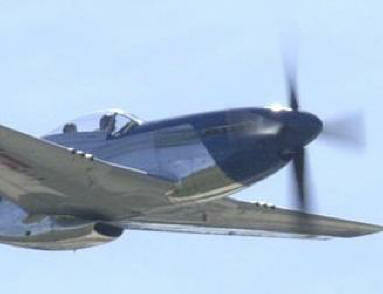 This P-51 shows severe paint damage on the radiator scoop as a result of dirt and dust being blasted back by the prop. 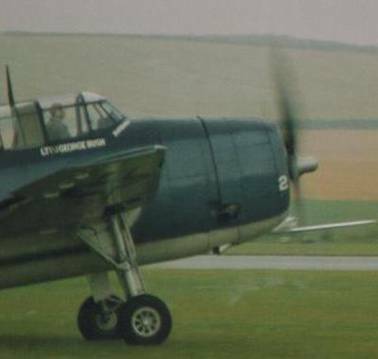 This Avenger, which is beginning its take off at Duxford, does not show any airfield weathering, 'though it does show how it can happen. If you look closely below the cowl ( grey streaks against grass ), you can see vortices of moisture sucked out of the damp atmosphere and also pulled up from the grass. Paint chipping, dents and scratches all happen during maintenance. Panels and cowls are frequently removed resulting in replacement screws and distorted panel edges. The replacement screws are unlikely to be painted. Paint will wear away on areas frequently walked on or held, such as the wing roots and hand holds etc. Replacement parts may not be painted such as on olive drab B-17's which received a natural metal finish replacement wing or tail plane. The cowl cooling gills on B-17's were fixed to the engine, so that a replacement engine on an old B-17 resulted in a ring of silver gills on an otherwise olive drab airplane. Several replacement fasteners can be seen on this Mustang engine cowling as a result of wear from the constant removal and replacement of the panels by the ground crews. Paint has also chipped away along panel edges. One of the major factors affecting the shape and form of weathering on an airframe is airflow. Leaks and drips that normally follow a near vertical route to the lowest point, now follow the boundary layer of air around the airframe. Oil streaks along the fuselage side arc up and then down following the airflow caused by the wing’s lift. Stains at the wing root may curl under the fuselage as the air over the wing rejoins below the fuselage. Propeller rotation also affects the airflow around an airframe and may cause stains to curve against the normal direction of flight. 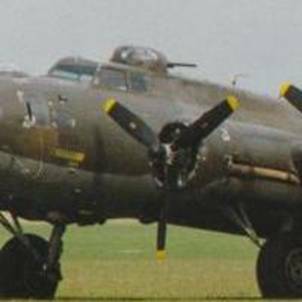 On the left wing of B-17's the oil staining tended to flow straight back. 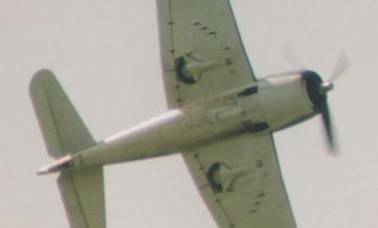 The rotation of air from the propeller was straightened due to the presence of the fuselage. On the right wing, airflow curved towards the wing root. This kind of weathering can be determined by studying several photographs of different airframes. 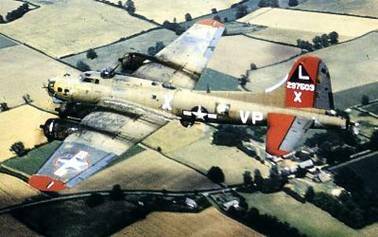 The prize for the scruffiest, most weathered, most patched B-17 must go to "Princess Pat". The airplane's paint has faded extremely due to ultra-violet exposure. Patches can be seen on the fabric control surfaces, which have been recovered and repainted at some point, as the metal trim tabs are a fresher green than the fuselage. The left outer wing panel has been replaced with one recovered from a "Hangar Queen" and due to its colour, has seen less high altitude flight. The engine nacelles are deeply stained from oil and leaking exhausts. Note how the staining thins out at the point where the wing vents are located, behind the rear spar, as air is drawn out of the wing. There you go, a brief guide to what makes an airplane weathered. Now you understand the many processes involved, you can go away and practice the techniques you know to apply ‘age’ to your model in a convincing manner.